Apart from my trip to the dark side a few weeks ago to watch the New York Red Bulls, my season ended over two months ago. Last season I managed to shoe-horn in 104 games in 14 countries between 1 July and 7 May. Nine weeks is a lifetime in football. But finally we had football back in our weekends. Our first game of the season ticked so many boxes. 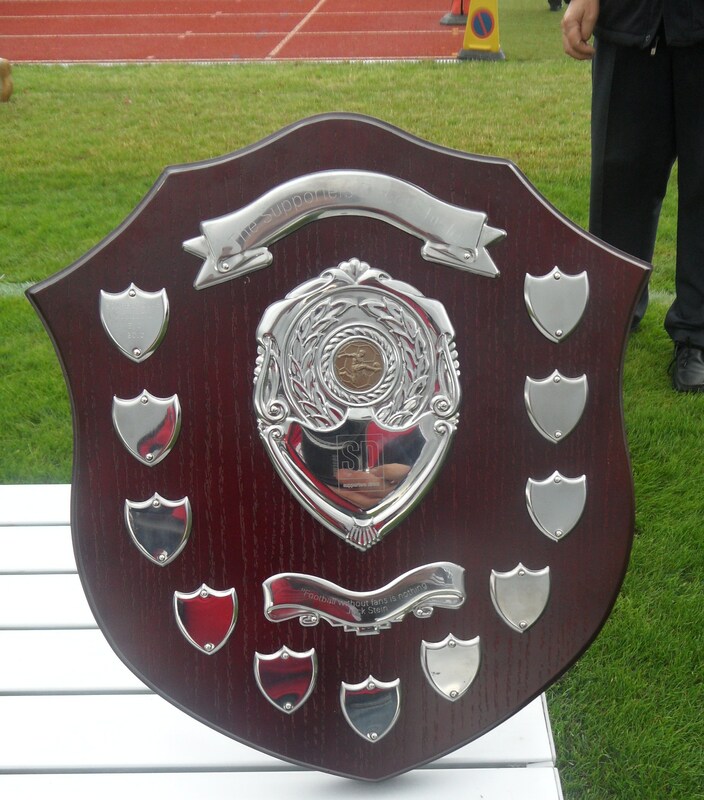 Lewes game; new ground and the chance to win our first bit of silverware for five years. Bring on the Supporters Direct Shield! 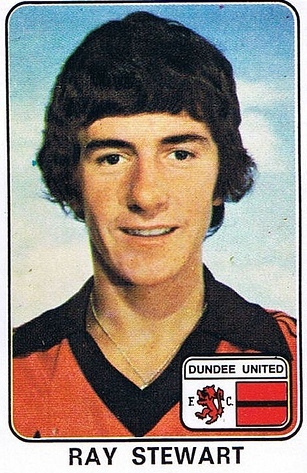 In 1979 West Ham United shocked the footballing world by signing Scottish teenager Ray Stewart from Dundee United. At the time there was no Sky Sports, no Internet and fortunately no TalkSport. There wasn’t even Radio 5 to carry this breaking news. It was the Evening Standard in those days, with the reporters being given the tip off for a breaking story and then filing it before the Fleet Street elite could get their hands on the story. So on a wet day in early September nineteen year old Stewart stepped off the train, on one of his first ever trips south of the border. The transfer fee was huge – £430,000. To put it into context the record transfer fee in English football was just £500,000 eight months previously. Whilst Trevor Francis had become the first ever million pound player in February 1979, only a handful of transfers had been for more than £400,000. And here was the relatively conservative West Ham United splashing out a ridiculous sum on a teenager who had played less than 50 games in the Scottish Premier League. Stewart would go on to make over 430 appearances over 11 years for the Hammers, and was the cornerstone of the most successful period in the club’s history. But the reason why he will always be a legend for the East Enders was his crashing left foot that led to 84 goals for the club and one of the most famous penalty styles in football which has been often copied but rarely been as deadly. Just 24 hours after he signed for the club he watched his new team from the bench in his Burtons suit, shirt and tie lose 2-0 to Watford at Vicarage Road. He was on the coach back up north to Barnsley for the League Cup 2nd round 2nd Leg game three days later, and four weeks later in the league game at Upton Park versus Burnley he scored his first penalty in a style that left most of the 18,327 fans starring in disbelief. He picked the ball up, carefully placed it down, with the valve pointing goalwards, turned, took a dozen steps back in a straight line. He then focused purely on the ball and where he was going to hit it. None of this “looking the keeper in the eye” business. He ran and struck the centre of the ball with all of the power in his body, both feet off the floor in a type of skip as he followed through. The fans went mad for his approach. In that first season he scored an amazing fourteen goals, making him the club’s second top scorer, and averaging nearly a goal every three games. He was a full back. Most were penalties, some literally game changing. 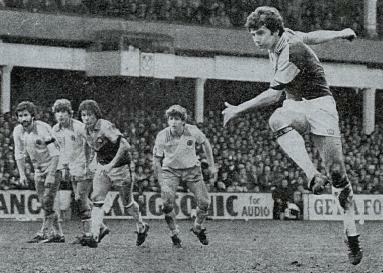 On the 8th March 1980 West Ham hosted First Division Aston Villa in the FA Cup quarter finals. This was Ron Saunders Villa who a year later would go on to win the title. They arrived in East London with a reputation for tough defending and fast counter attacking play with the exciting Tony Morley on the wing, and Gary Shaw up front. The game was goal less, heading towards a replay at Villa Park when West Ham got a corner. The ball was delivered in the box and an arm went up in the air. It was hard to see if it was Alvin Martin or Ken McNaught’s but the referee deemed it the Villa man and pointed to the spot. One kick separated West Ham from the semi-finals and Stewart stepped up, showing no sign of nerves and smashed the ball home. He blotted his copybook in the Semi-Final at Villa Park against Everton though, showing the rash side of his play when he was sent off in the first half for fighting with Brian Kidd. Fortunately he served his suspension long before the final against Arsenal where he won his first honour as a player. In fact, Stewart has the unique distinction of being the only West Ham player to win the FA Cup who wasn’t English. That is quite an amazing stat when you look at football today. Three FA Cup finals spanning sixteen years, with thirty one players used, and thirty were English. 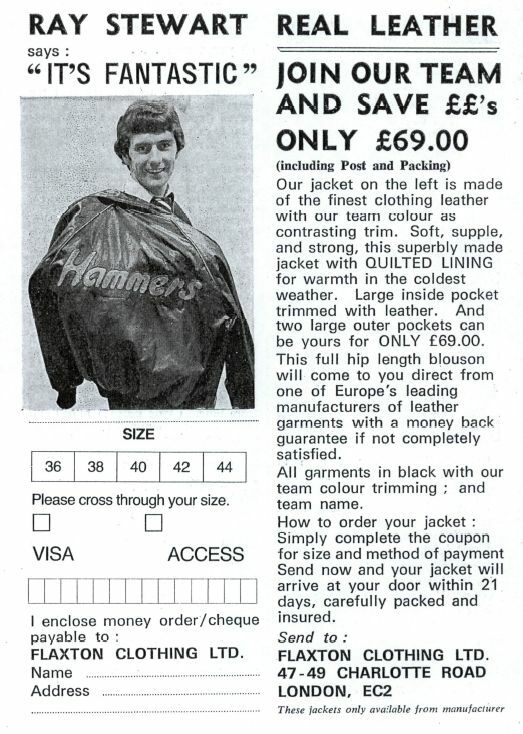 In 1980/81 he was an integral part of the record breaking West Ham side that waltzed to the Second Division Title as well as reaching the European Cup Winners Cup Quarter Finals. He scored nine goals in sixty appearances, only missing one game all season. He was a fans favourite and in the days when the word “Marketing” was as foreign to football clubs as a Bosman or Sepp Blatter and the club often rolled him out to shamelessly promote products that fans lapped up. If there was any ever doubt about his composure it came on the 14th March 1981. The venue – Wembley Stadium. The Twin Towers. West Ham United, from the second tier of English football against the mighty Liverpool, League Champions, who would go in to win the European Cup later in the year. After ninety minutes the game was goal less. Both teams had chances, but a betting man would have put his house on Liverpool to triumph. In extra time the first moment of controversy. With just two minutes remaining a corner is cleared by Phil Parkes. In the process Sammy Lee is knocked to the floor. The ball falls to Alan Kennedy and the full back finds the back of the net from distance. BUT Lee is lying in the penalty area, obstructing Parkes view. However, the referee is Clive Thomas. A man who controversy follows around and he deems that Lee is not interfering with play. West Ham take heart from the injustice and launch one last attack. A corner is sent in and Alvin Martin rises the highest and sends an unstoppable header into the top corner of the net. A hand rises and stops the ball but not that of Liverpool keeper Ray Clemence. It is Terry McDermott, and try as he might, Thomas cannot do anything but award West Ham a penalty (he does however fail to send off McDermott). The clock has now stopped at 120 minutes and one man stands between Liverpool winning the cup. Ray Stewart. Twenty one year old Ray Stewart. The hopes of thousands of fans on his shoulders. He steps up but instead of smashing it home he calmly slots the ball down the middle of the net. West Ham live to fight another day, losing the replay some three weeks later at Villa Park. The following season in the top division Stewart plays every game, scoring thirteen times, following it up with double figures in the next few years, maturing and being rewarded with ten international caps. In 1985/86 he played in possibly the greatest West Ham side, the one that ran Liverpool and Everton until the last Saturday of the season for the title and claiming an amazing 84 points. Stewart’s contribution came into its own in the unbelievable run in in March and April which saw West Ham have to play seventeen league games in just fifty six days – a game almost every three days. He scored a goal (not a penalty) in the amazing 8-1 win versus Newcastle United, and actually gave the ball to Alvin Martin when the Hammers were awarded a penalty so he could complete his hatrick. A week later his late penalty sees off Manchester City and then just two days later(!) in front of a season best 31,121 West Ham come from behind to beat Ipswich Town with Stewart again netting a high pressure late penalty winner to take the Hammers to second in the table. His last season at the club was in 1990/91. 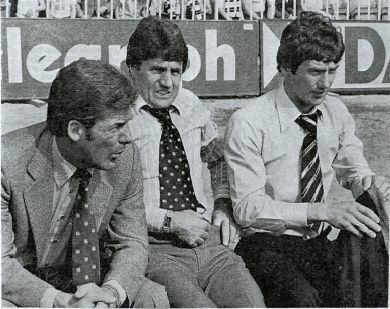 With young Steve Potts and Julian Dicks breaking through into the team he found his chances limited, deciding to move on to St Johnstone after 345 games and 62 goals for the Hammers. 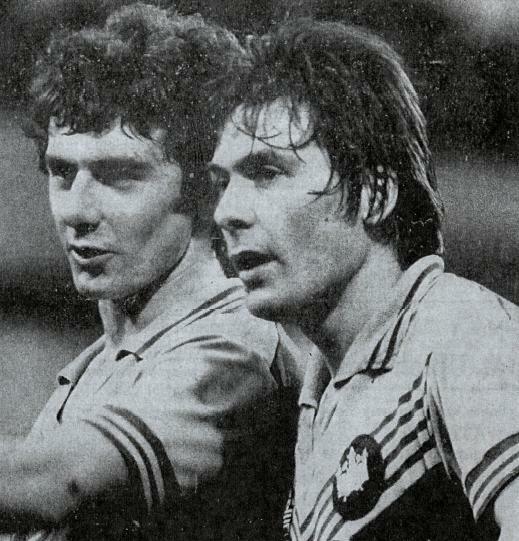 Ironically Dicks modelled his penalty style on Stewart and himself went on to score 50 goals in 260 games for the Hammers – a strike rate almost comparable with the master, Ray Stewart. When I was in the playground as a young teenager all I wanted to be was Ray Stewart. When it came to taking penalties with the tennis ball, the Stewart approach used to ensure the keeper would be quaking in their boots at the thought of that small ball thundering towards their face. For that reason alone, we salute you Ray, you are a true legend of the game. Photos with thanks to Steve Bacon and Newham Recorder from West Ham United programme archives.